George Oliphant and his team of designers and contractors arrive to transform the Ulrich brothers basement bedroom into a hangout suite. The Ulrich family of Little Falls, NJ vaguely ressembles a small basketball team, with three brothers over 6-feet tall. Sharing a basement bedroom filled with safety hazards and eyesore “decor,” the Ulrich boys could not have been better candidates for George to the Rescue. George Oliphant and his team of designers and contractors arrive to transform the Ulrich brothers basement bedroom into a hangout suite. The transformation extends to include sister Jenna’s pink princess bedroom as well. Giving each sibling a space of their own, George to the Rescue delivers yet again. 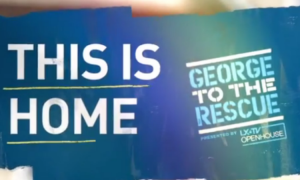 A heartwarming story for a very deserving family, click here to view the complete segment of George to the Rescue. Welcome Home, Amy Van Dyken-Rouen! 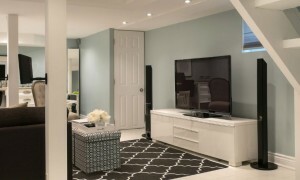 Transform your basement into a living area, laundry, bathroom or workspace you can use now — without a full renovation. Even New York's Finest need a rescue sometimes. "Home is the place where you feel most peaceful." George to the Rescue gives the Klein family of Floral Park, NY peace of mind in the form of a beautiful backyard.